Key difference: Japanese face is generally longer and/or more oval and wider than the Chinese face. Hence, Japanese eyes tend to appear wider. Most Japanese women have single eyelids. Also, Japanese eyes tend to be angled upwards a little. Chinese tend to have round-shaped faces, while, typical Chinese eyes tend to have angled somewhat downwards. However, a number of Chinese eyes tend to be angled upwards, as well. It is extremely difficult to differentiate the eyes of closely related Asian countries such as Japan and China. This is mainly because they stem from the same geographic location and hence have faced similar anthropological differences. Due to this, they have developed and evolved similar characteristics, which have helped them over the years. An example of this would include the eyes. 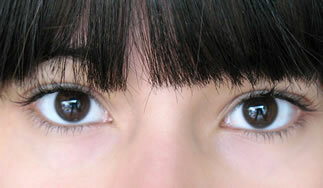 All Asians, including Japanese, Chinese, Koreans, etc., are considered to have smaller eyes than the Western population. However, this is not the case. Asians eyes are the same sizes as the rest of the human population, but they appear to be smaller due to their slanted shapes. There is a reason as to how and why Asians have developed slanted eyes. In Asia, the weather can reach extreme conditions due to the wind and cold. The slanted eyes and the single eyelids are an evolutionary response to this kind of weather. Single eyelids are when the eyes do not have an epicanthic fold; hence they do not have the characteristic fold in the eyelids. When one is out on a really windy day, we tend to squint, or half close our eyes instinctively in order to protect our eyes from the wind and the flying debris. We do the same to protect ourselves from bright sunlight reflecting on the snow. That is what the slanted eyes and the single eyelids do for the Asians, just biologically, instead of instinctively. The lack of the epicanthic fold allows the eyelid to cover the innermost part of the eye, in order to give maximum protection. However, unlike some racial slurs indicate, this does not affect their eyesight in the least. The problem with differentiating between Japanese and Chinese eyes is that both nationalities have these features. Also, while we may differentiate them according to country borders, nature does not. They have evolved similarly and hence differences among the eyes cannot be generalized to the entire Chinese and Japanese denominations. Still, one may argue that since Japan is an island and the population was limited to the island for millennia, they may have some differences as compared to the Chinese. While this statement is correct, another problem arises: China is a very big country with numerous languages and sub-races. Due to this, Chinese appearance has become much diversified and hence cannot be generalized in order to be compared. Furthermore, China has vastly influenced Japan. Many Chinese have immigrated to Japan, introducing Buddhism as well as interbreeding with the Japanese. This has further adding confusion to their generic appearances. However, if one must differentiate, one can probably claim that the Japanese face is generally longer and/or more oval and wider than the Chinese face. Hence, Japanese eyes tend to appear wider. Most Japanese women have single eyelids. Also, Japanese eyes tend to be angled upwards a little. Chinese tend to have round-shaped faces, while, typical Chinese eyes tend to have angled somewhat downwards. However, a number of Chinese eyes tend to be angled upwards, as well. This is why it is extremely hard to differentiate or generalize an ethnic look. Instead of generalizing a typical Chinese or Japanese look in order to differentiate between the two ethnicities, one should focus more on other observable indicators such as name, language, behavior, hairstyle, clothing, etc. However, the easiest way to differentiate between them would be to just ask politely. This article must have been written by a non-Asian person, because all the information is stereotypical and is not true overall. Do some research and get your facts straight. Stop writing false racial information, buddy. That backwards word "interbreeding" between Chinese and Japanese said in the article is grossly insensitive and just plain wrong. We use the word "interbreeding" between plants and animals NOT in regards to humans. I know this stuff as I grew up in a family in the 1950's where I had multiply encounters with people of different racial and ethnic backgrounds. All encounters were positive. The correct term to use to describe the blending of peoples is just that, "blending" or "blend." For example, I am of "blended" racial background. Do not use the word "breed" to describe people, that word again is strictly used only in botany and animal husbandry. Thank you. Quite valuable information this website has... I always found it difficult to tell the differences between Koreans and Japanese due to lots of tourists from many other parts of Asia! Wrong. They actually have an extra fold then the rest of us and the epicanthic fold IS an Asian trait. And why they have it is unknown. Your explanation is as good as any other I've heard but its still just conjecture. Please do more research and do not present speculation as evolutionary biology. It's easy. Just before you start saying why the Asians have a certain eye shape (which on appears slanted because of the EXTRA fold) that many believe, instead of presenting opinion as fact. "your explanation is as good as any other I've heard"